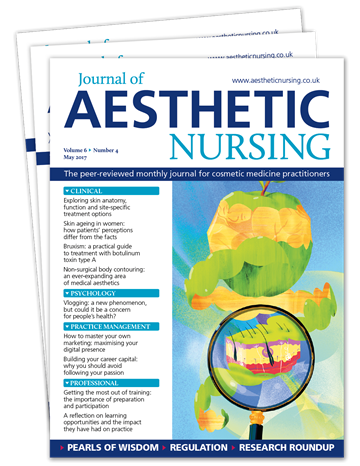 Journal of Aesthetic Nursing (JAN) is the UK's leading journal for nurses involved in aesthetic medicine. We understand that this developing clinical specialism requires practitioners to learn advanced skills and work autonomously, but without the level of support that other healthcare professions enjoy. This is why every edition contains the information that you need. Including clinical reviews, professional guidance and insights into key management issues, the journal will support your professional development and the success of your practice. Subscribe now and get your first issue for only £1 - a saving of 96% on our normal rate. 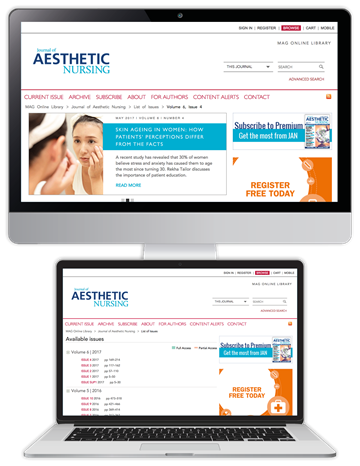 Try Journal of Aesthetic Nursing today and discover how we can help you professionally. We are sure you won't be disappointed - but you can cancel your subscription anytime. *£1 for the first issue of your subscription. Price will revert to standard rate of £31.00 per quarter therafter. Payment taken by Direct Debit every three months.